We may still be waiting for piles of snow to melt but it’s never too early to start planning for Easter! Yes, I’ve already started eating Easter chocolates…someone has to test them all out first, right? For this month’s free printable, I wanted to create something cute for Easter so we came up with these sweet Easter Bunny bag printables. 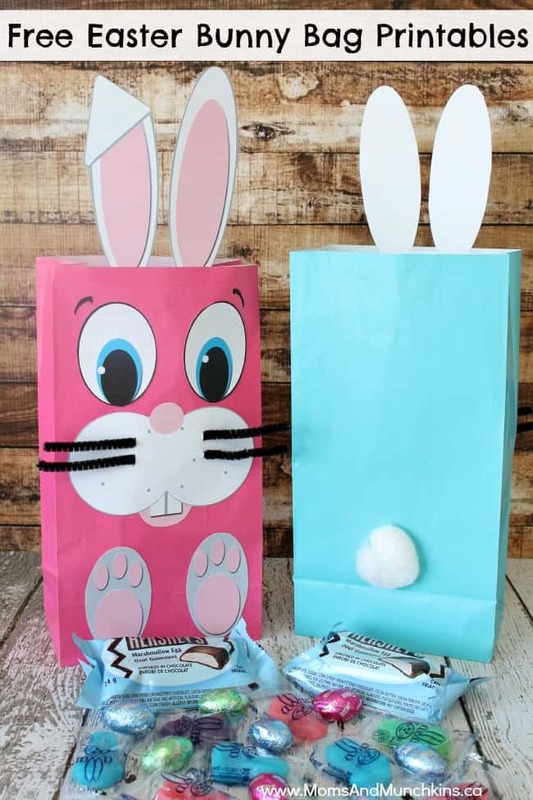 Alyssa of Just A Little Sparkle created the printables for us in a full size format so you could also print them to use as Easter Bunny photo props for cute pictures with your family. If you are printing these for Easter Bunny bags, you’ll want to reduce the size of the file before printing. Simply set your PDF file to print as a Tile setting at 15%. You may have to adjust your settings slightly depending on the size of the bags you are using. If printing as photo props, you can print at full size. Cut out each Easter Bunny printable and glue the eyes, feet, and nose to the front of the bag. Glue the ears inside the front piece of the bag. Using a craft knife, cut two small lines on each side of the bunny’s nose and loop black pipe cleaners through each hole. I cut one pipe cleaner in half for each bunny so one pipe cleaner will give you the 4 whiskers shown in the picture here. Glue the cotton ball tail to the back of the bag. That’s it! Now you have your adorable Easter Bunny bags! These Easter Bunny bag printables are available for FREE for our monthly newsletter subscribers! Signing up is free & easy – we have over 6000 subscribers! Simply enter your email address, confirm your subscription, and you’ll be directed to a Thank You page with a link to the freebies page along with the secret password. This link and password will also be repeated in each of the monthly newsletters. 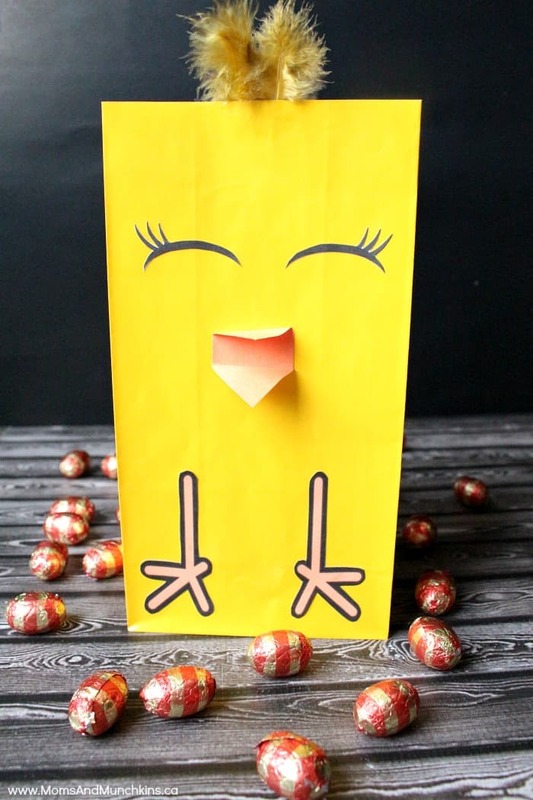 Don’t miss our Easter Chick free printable bags too! Hi Wanda! I’ve tried to email you but the messages are bouncing back to me as undeliverable. Once you first signed up for the newsletter, you should have been taken to a Thank You page with a link to the freebies and the password. This is then repeated in each of the monthly newsletters. If you send me an email (see the “contact” button at the top of the page), I can email you the password and link. Hi Karen! I’ve sent you an email to see if I can help you out. These are really cute! I’ve been trying to figure out my plan for our Easter open house this year. I always like to do something fun for the kids that come. These just made the list. Thanks! That’s wonderful – thank you! Cute! This post has been pinned to our Thursday Favorite Things group board. How do I get the printout to make this??? Hi Leila! You’ll see a link near the bottom showing that these printables are available for newsletter subscribers. Once you sign up for the free newsletter, you’re then taken to a page that has a link to all the freebies plus the password. I have subscribed but cannot find the link for the printables on the newsletter. Can you help? These are too cute! I can’t seem to resize the photos to print out smaller copies. It also won’t allow me to edit the photo, so I’m lost as to how I should make these fit on a small bag. Your help would be greatly appreciated! Hi Amanda! When you go to print it, there should be a printer setting like “scale” or a percentage you can decrease. It’s not editing the file, it’s just adjusting the size of the print. I hope that helps! Hi Diane! I’ve sent you an email. I have subscribed but cannot find the link for the printables on the newsletter. Can you help me please ? Hi Latoria! I sent you an email back in March but forgot to reply here as well. I hope you received the email. Thanks!